which will develop into fruit. at a farm on Oahu. is critical to a plant's success. While you're enjoying the sweet taste and creamy texture of a fresh papaya—whether it's in a zesty salsa, colorful fruit salad, or refreshing shake or served alone with a splash of lime juice—scientists from the Agricultural Research Service are busy delving into the genetic makeup of this tropical fruit. Their goal? To ensure that there will always be a good, affordable supply of papayas at your market. Papaya trees are remarkably precocious. Unlike apple trees, for example, which typically take at least 4 years to bear fruit, papaya trees offer delicious, ready-to-pick fruit less than a year after they're planted. But producing perfect papayas—at a profit to growers—can be problematic. 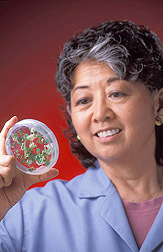 Plant physiologist Maureen M.M. Fitch of the ARS U.S. Pacific Basin Agricultural Research Center in Aiea, Hawaii, explains that yields typically taper off once trees reach 3 years of age. By then, the trees have usually grown so tall that their uppermost fruit may be beyond the reach of the picking poles that workers use to harvest the crop. This means that most papaya orchards have to be replanted every 3 to 4 years. In addition, papaya trees lack an anchoring taproot, so whole orchards are vulnerable to being flattened by the 30- to 40-mile-an-hour winds that blow in from the Pacific. All this can add to the cost of producing papayas. Fitch is smoothing out the wrinkles in a high-tech approach to simpler, less costly replanting. Her research could slash costs by eliminating the current practice of cultivating five seedlings per planting hole. Why do growers plant five seedlings for every hole? 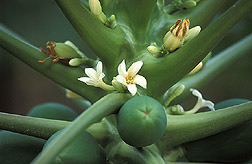 "Papaya trees," says Fitch, "can form male flowers, female flowers, or perfect flowers, which have both male and female flower parts." Only perfect flowers yield the elongated, somewhat pear-shaped fruit that's preferred in the markets where Hawaii sells its papaya crop. "Growers know that they have a 97 percent chance of getting at least one perfect-flowered papaya tree if they plant five seedlings per hole," she says. "That's why they plant so many extra seedlings. "When seedlings are about 3 to 6 months old," notes Fitch, "they show flowerbuds that reveal the kind of flowers the trees will soon bear. Growers can check the flowerbuds and then chop down any trees that won't form perfect flowers. Typically, growers are left with one seedling per planting hole—or sometimes none." The goal of Fitch's research is to produce papaya seedlings that are nearly certain to bear only the perfect, male-female flowers. She starts with plantlets reared in petri dishes in the laboratory, a process called micropropagation, and then genetically tests them to verify that they will produce perfect flowers. The lab test that makes this genetic screening possible was developed at the University of Hawaii. Fitch says that, with genetically screened plantlets, farmers should need to plant only one plantlet per hole, making cultivation cheaper and faster. Plantlets that pass the screening are carefully clipped of shoots. Fitch says that each petri dish shoot can yield an average of seven shoots per month, all of which can be used to start new plantlets. After a stint in the greenhouse, the plantlets should be ready to go outdoors. Preliminary results from Fitch's studies indicate that trees that started as laboratory plantlets bear market-size fruit about 1 to 3 months earlier than conventionally grown seedlings. They remain notably shorter in stature, thus keeping their fruit within easier reach at harvest and making them less vulnerable to gale-force winds. Conventional seedlings, on the other hand, have to put on height so they won't be shaded out by other seedlings that share the same planting hole. Micropropagation of papaya trees isn't new. But the procedure Fitch is fine-tuning may be the first that will be available, for free, to growers and breeders worldwide. In addition to determining the type of flower a tree produces, papaya genes mastermind other prized traits that are of keen interest to scientists and breeders alike. For instance, ARS plant physiologist Henrik H. Albert at Aiea and University of Hawaii graduate student Xiaohui Qui have pinpointed more than two dozen genes that appear to bolster papaya's ability to fend off harmful microbes such as the fungus Phytophthora palmivora, which causes fruit and root rot. Some of these genes are similar to other disease-resistance genes that researchers elsewhere have already identified in other plants, such as rice. "But we also found novel genes, not previously known to be involved in disease resistance," says Albert. Albert and Qui did their work with Fitch, ARS plant physiologist Paul H. Moore, and Dennis Gonsalves, director of the ARS U.S. Pacific Basin Agricultural Research Center. 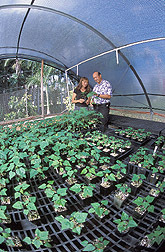 Researchers from the Hawaii Agricultural Research Center were also involved. In related experiments, Hawaii scientists have done an exacting comparison of the genetic profiles of more than 60 kinds of papaya, from the familiar Papaya carica varieties that we eat to lesser known, wild-papaya species. The analysis, conducted by Moore and Fitch at Aiea, along with ARS horticulturist Francis T.P. Zee and several others, was more comprehensive than earlier comparisons. And the team used newer, more precise techniques. Their work confirmed that the varieties we buy at the supermarket are all genetically very similar to each other. The problem with this is that they lack the safety of a broad genetic base that would make them better equipped to deal with natural adversity. These new genetic studies also confirmed that ARS's papaya collection, of which Zee is curator, apparently encompasses an impressive 80 percent of all papaya genetic material, also called the papaya gene pool. 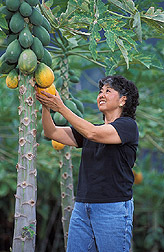 A next step is to use genes from the unique papayas in the collection to help breeders enhance and safeguard today's most popular papayas.—By Marcia Wood, Agricultural Research Service Information Staff. To reach scientists named in this article, contact Marcia Wood,USDA-ARS Information Staff, 5601 Sunnyside Ave., Beltsville, MD 20705; phone (301) 504-1662, fax (301) 504-1641. "PAPAYA! High-Tech Tactics Enhance a Tropical Favorite" was published in the January 2004 issue of Agricultural Research magazine. Imagine a papaya the size of a football! In Thailand, such hefty, flavorful papayas, weighing easily 8 or 9 pounds, are a familiar sight at produce markets. These mega-papayas can also be found—along with their familiar and other unusual cousins—at the U.S. repository for this exotic tropical fruit. The repository's offices, laboratories, and greenhouses—along with some of its orchards—are tucked away in the lush Kulani rainforest on the outskirts of Hilo, Hawaii. Formally known as the ARS National Clonal Germplasm Repository, it is an international treasure trove of cultivated Papaya carica varieties and their wild relatives. Why keep these papaya seeds, cuttings, plantlets, and trees? "To make sure that their genes remain in the breeding pool," says curator and horticulturist Francis T.P. Zee. 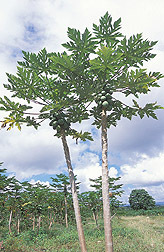 Genes could vanish if wild papayas are evicted from environments where they presently flourish. Genes can also disappear as older commercial varieties fade away, outsold by newly popular ones. Commercial papayas in the collection include Hawaii's single-serving-size "solo" varieties, like Sunrise and Sunset, each pink to salmon inside, and the attractive golden Kapoho. These pear-shaped, 1- to 1½-pound papayas are just the right size for one person to eat at a sitting. The trees in the collection come from Florida, Puerto Rico, Malaysia, Taiwan, China, and Australia, as well as from Central and South America. "Some unusual species have pink blossoms instead of the typical white," notes Zee, in commenting on some of the features of the different plants in the collection. "Some resist plant viruses, while others are extremely vulnerable to infection. "One relative, Jacaratia spinosa, makes a nice 12- to 15-foot ornamental tree. From Paraguay, it bears small orange fruit and is easily produced from seed. At 4 or 5 years, it appears as stately and mature as trees 30 or 40 years old. Our visitors from Southeast Asia think it would be ideal for their formal gardens. 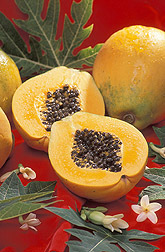 "Some papaya trees thrive in cold weather, like Carica pubescens, from Colombia, or C. stipulata, from Ecuador. We've planted them about 30 miles from here, at Volcano, where it's higher and colder." The collection's primary users are plant breeders and scientists. "Our papaya specimens were very important to the team that developed ringspot-virus-resistant papayas," Zee says. Team members Dennis Gonsalves, now director of the ARS U.S. Pacific Basin Agricultural Research Center at Hilo; Maureen M.M. Fitch, plant physiologist with ARS at Aiea (see story, p. 4); and their co-researchers are credited with helping Hawaii's papaya industry rebound from this devastating plant pathogen. 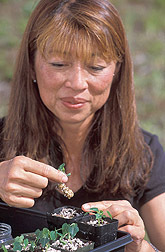 The Hilo repository is part of a nationwide network of ARS-managed collections.—By Marcia Wood, Agricultural Research Service Information Staff. Francis T.P. Zee is at the USDA-ARS U.S. Pacific Basin Agricultural Research Center, 920 Stainback Hwy., Hilo, HI 96720; phone (808) 959-5833, fax (808) 959-3539.